We are so happy to announce that we have reached our £500 minimum in just two weeks of fundraising! So we'd like to thank everyone so much for what we have achieved. It is through your tweeting, sharing, Facebook, and donating, that we've been able to smash our minimum in such a short amount of time. WOW! You are a star! Well done! 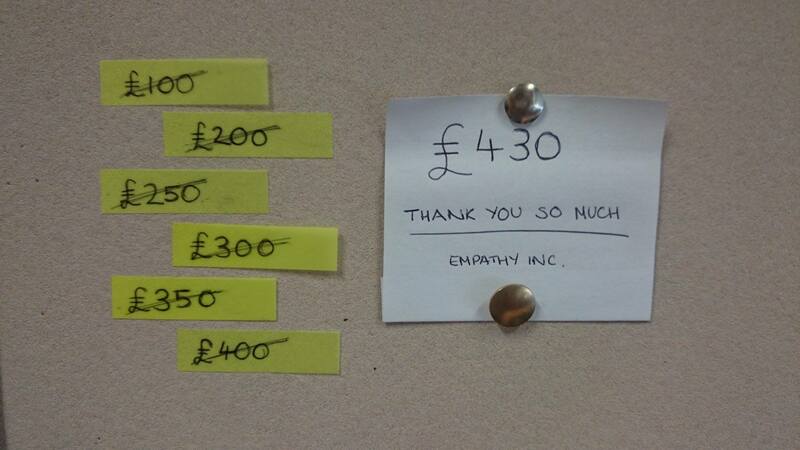 In just 48 hours you've helped us raise £110! This is phenomenal and we couldn't be happier - thank you so much. Of course, we still need to raise the rest of the £390 for our minimum, so now is not the time to slack off, please keep sharing our message and campaign to everyone you know. For being so generous, we'd like to offer you everything above and have your name written in the catalogue that goes along with the exhibition, so that the wider public knows that this couldn't have happened without you! As a mark of our gratitude not only will we do everything outlined in the previous rewards, we would like to give you a mug for your work place, which has the Empathy Inc. logo on. Show it off to your co-workers! Our highest reward will give you everything previously stated, plus welcome drinks for your private tour!